Garmin last year partnered with Amazon to create Garmin Speak, an Alexa-enabled GPS navigation product. The Speak is a simplified GPS navigator containing a miniaturized Amazon Echo. It arrived in November but is already set to replaced by an upgraded version called the Speak Plus. The Garmin Speak Plus is almost identical to its predecessor. 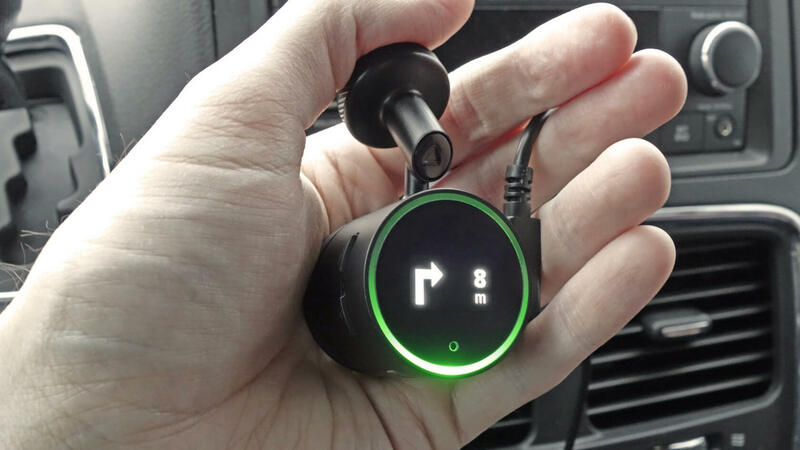 It is a cylindrical device that mounts to your windshield and features a 0.8-inch OLED display that shows simplified driving instructions (left turn in 20 feet) rather than a map. There is also an LED ring encircling the screen that only lights up when the driver is speaking with Alexa (or when it is announcing alerts). As Garmin revealed at CES in Las Vegas today, the Speak Plus hardware will have one significant difference — a dash camera. Just like many other dash cams, this one continually records a loop while you drive and saves the clip if it detects an incident. This feature is nice to have but it is the software that utilizes the camera that makes it especially useful. Using the camera as a sensor, the Speak Plus can detect lane departures and forward collisions and issue warnings to the driver. The lane departure warning will sound if the driver drifts out of the lane or off the road. The forward collision warning will “sense” cars to the front and issue a warning when driving too close or closing in too fast. It even has a “Go" alert that will sound when stopped in traffic and the cars ahead begin to move again. No more getting honked at because you’re busy trying to find a radio station while stopped at a light. Plus with Alexa, it can pretty much do anything an Echo can do. You can have Alexa play your music, check your calendar or the weather, and even play interactive games with passengers. The original Garmin Speak retails for $148. The Speak Plus commands $229 but Garmin is going to let it go for $199 to those who pre-order. Launch is set for mid-February; you'll be able to pick one up from retailers like Best Buy and Amazon. Those wishing to pre-order can do so through the Garmin website.